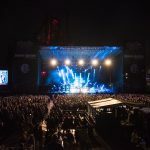 SEATTLE(CELEBITYACCESS)–Pearl Jam will perform before nearly half-a-million fans on its tour of Latin America, which kicks off on November 4, 2015 in Santiago, Chile and wraps up on November 28 in Mexico City. As they’ve done for over a decade, the band will track their carbon dioxide emissions resulting from their 2015 live performances and offset them through strategic investments in carbon mitigation projects. Their two newest investments are both certified REDD+ (Reducing Emissions from Deforestation and Degradation ‘plus’) projects in South America: Conservation International’s Alto Mayo Project in Peru, and Carbonfund.org Foundation’s Valparaiso Amazon Rainforest Project in Brazil. “I think it’s good to acknowledge the negative impacts our business has on the planet, right alongside the positive ones. We tour. Our tours emit carbon dioxide. We are constantly looking at ways to reduce and mitigate that. Our strategy has been to essentially ‘tax’ ourselves for our CO2-equivalent emissions, and invest that money into carbon mitigation projects. Hopefully this will serve as inspiration for other businesses and governments exploring ways to offset their carbon footprints,” says Pearl Jam’s Stone Gossard.